The deal breaker on circle lenses or any contact lens for me is their wear and comfort. Kim of KimKine has raved about the Silicone Hydrogel Circle Lenses and I have been extremely curious on why she thinks this is way better than regular circle lens. For someone who has been wearing soft contact lens for more than 10 years, I have gone through a lot of regular soft contacts and circle lens but I haven't heard of these Silicone Hydrogel lenses until I came upon Kim's reviews. Surprisingly, after researching this particular type of lenses, I have actually tried them before (Air Optix Aqua) and didn't realize it! Today's review will be on the GEO Eyevelyn in Brown sent by Pinky Paradise. 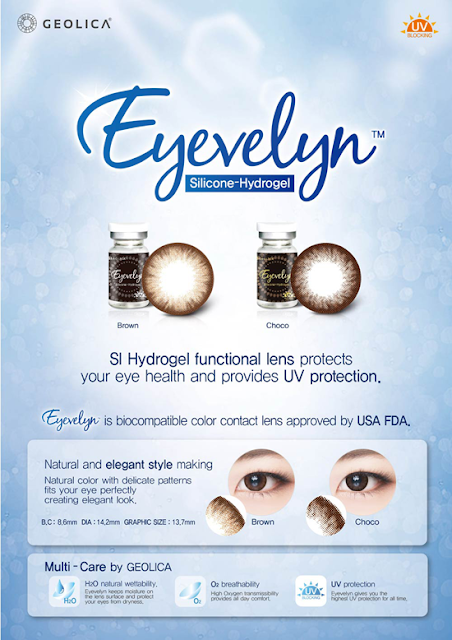 The Eyevelyn series from GEO Medical are silicone hydrogel lenses. The most common problems that contact lens users encounter are red eyes, blurred vision and eye discomfort which is due to hypoxia or lack of oxygen. Silicone Hydrogel lenses are more advanced than regular, soft, hydrogel lenses since they allow more oxygen to go through the lenses into the cornea thus will enable your eyes to breathe more and retain moisture for a longer period of time than the regular ones, greatly reducing the instances of hypoxia. GEO Medical is my favorite brand of circle lens after buying my first ever circle lens by them 8 years ago. I didn't even try other brands other than GEO for years until I started this blog in 2011. The Eyevelyn Silicone Hydrogel Circle Lenses has a diameter of 14.2mm, 0.2mm slightly bigger than the average circle lens at 14mm. A 48% water content, base curve of 8.6mm and 1 year of life span. It's specs are very similar to other regular circle lens but with a slightly higher water content of 48% whereas most circle lens only have 38%. All GEO lens vial comes with an authentication code which you can check on their anti-fake website. The Eyevelyn comes in two colors, Brown and Choco. Brown is lighter and has a more golden tone to it while the Choco is a much deeper shade of brown, great if you have a lighter colored eyes to achieve a two toned effect. What I have here is the Brown which gives a very natural eye look. It doesn't have a thick and dark limbal ring (the black outer ring) which gives the big eye effect thus the 0.02mm extra in its diameter isn't really that noticeable. It gives eye enlargement but very slight and very natural as well. You can't even tell they are circle lenses since they look like your real eye color. I certainly didn't have a problem with their wear. I have used this particular lens for over 16 hours and I only had discomfort when the wind was blowing right on my eyes. My eyes didn't dry out as easily in comparison to wearing other circle lens. I don't suggest wearing any contact lens that long but there are some really tough days that you can't help but wear a lens that long and the GEO Eyevelyn Silicone Hydrogel Lenses really helped me battle such a day. I'm really glad I tried out the silicone hydrogel lens! It's super comfy and I really love how they look. It's natural and gives a slight eye enlargement that is just perfect for me. Thanks to Kim for introducing me to Silicone Hydrogel Circle Lenses and to Pinky Paradise for allowing me to try out the GEO Eyevelyn. I'm excited to try out more silicone hydrogel circle lens in the market and I'm also very happy that GEO Medical hasn't failed me in any of my circle lens. The GEO Eyevelyn retails for $23.90 at Pinky Paradise. Each purchase of a pair of the Eyevelyn comes with a cute macaron case. 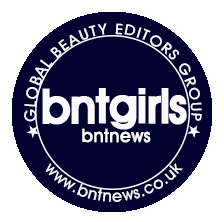 Pinky Paradise has been around since 2006 and is a trusted and renowned online retail merchandiser of trendy circle lens. Their CUSTOMER SERVICE is excellent. Despite this post to be a sponsored blog post, I have previously purchased from Pinky Paradise and I know that they truly deliver and they answer any questions you might have about your purchase or orders. They have 900+LENSES to choose from with authenticity guaranteed. They also offer free shipping to orders over $130.